Pesticide controversy has been affecting the sales of Pepsi and Coke since last month. It’s been a month since the controversy started and I’m yet to see any creative ads from the cola majors to refurbish their brand image. They are simply responding with full page fact sheet like statement in newspapers and shops to counter the controversy. I really doubt if anybody has the patience to go thru all the details. It certainly has not created the desired impact. Some months back similar adversity affects the poultry market due to the bird flu virus. 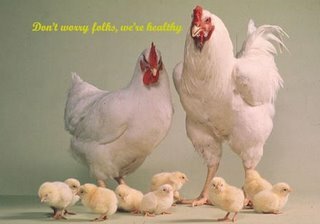 At that time Poultry association came up with a beautiful ad, where a chicken with its family saying to the public, our fever has cured and we’re fine now. The picture clearly expressed what they want to convey, with out the need for series of statements. As I started thinking more about the ad to counter the controversy, I got this idea. It starts with a kid in a mall starring at the cola with desire, but hesitant to pick one. Now the cola bottle got life and starts speaking. It explains what it saw, like a group of Scientists testing the content in various stages and how it got filled up and come to this shop. Then all types of bottles, tins and cans containing the cola coming out and saying in unison “We are Safe”. Ad can end with the kid happily going out drinking cola. They can also add an aggressive punch line like this in the end – Drink Cola , Digest Rumours. Business should not be made to suffer till the noise level dies down. Creative leaders who had set the bench mark in the industry with campaigns like ‘Yeh Dil Mange More…’ and ‘Thanda Matlab Coca Cola’ have to wake up to create another magic. Now both Coke and Pepsi responded back with an Ad, i revisited here. Pepsi used their CEO for the ad, which make the Ad look like a lecture from a professor. Coke’s Amir Khan’s Strategy is better. Both the ads followed the same theme of using research lab kind of environment(as suggested here :-}) to stress that they do lot of quality checks. And the mood in both the ads is a bit dull and subtle (Had they accepted defeat??) instead of being bold and with some fuzzy theme. So still i love my theme.